It's meaty, cheesy, and just perfect. 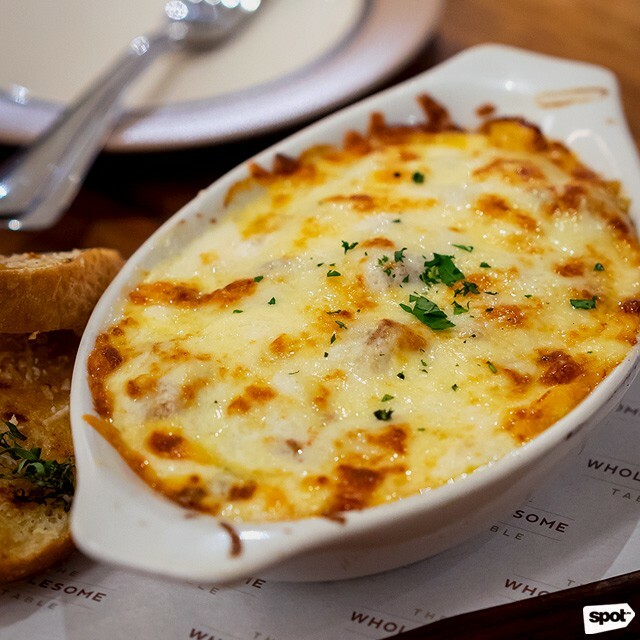 (SPOT.ph) Layers upon layers of cheesy, meaty goodness come packed in this classic pasta dish. 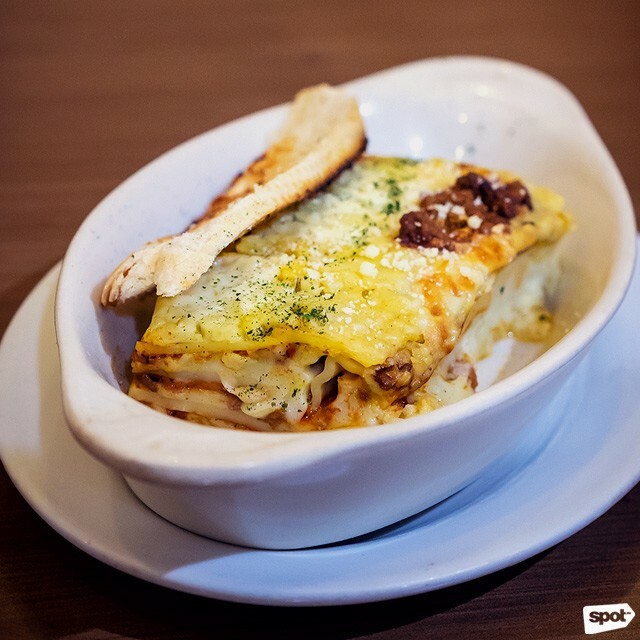 It’s fair to assume that after the tangy spaghetti bolognese and creamy carbonara, lasagna would be up there as one of Filipinos’ favorite pasta dishes. That said, this dish, composed of flat pasta noodles, ragout, cheese, and béchamel sauce, is not the easiest to come by in the Metro. 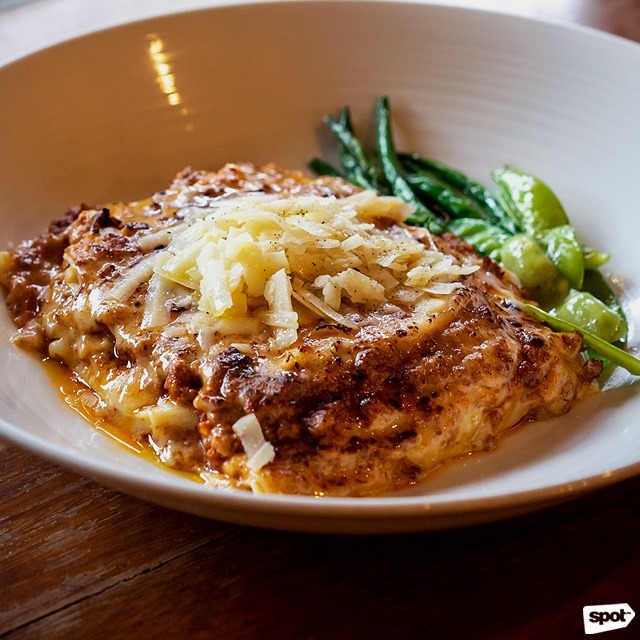 Many restaurants, whether Italian or just serving classic comfort dishes, have phased out their lasagna offerings so just a few savory versions of Garfield’s favorite pasta remain. We’ve sorted through the top hits and left just the best choices—perfect, by the way, for the rainy weather—so you can get your lasagna fix in a jiffy. 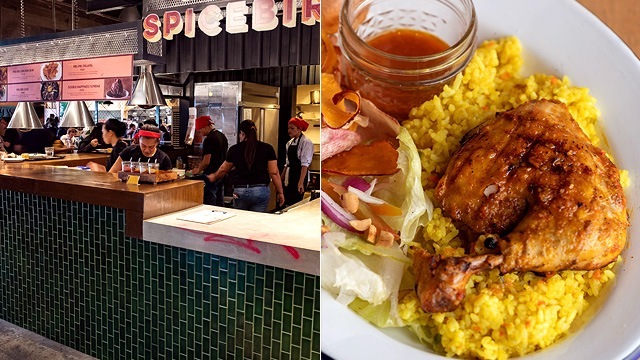 If you’re looking for a quick bite at the mall but want to avoid the usual quick-service chain or food court, The Old Spaghetti House or TOSH is a good option. 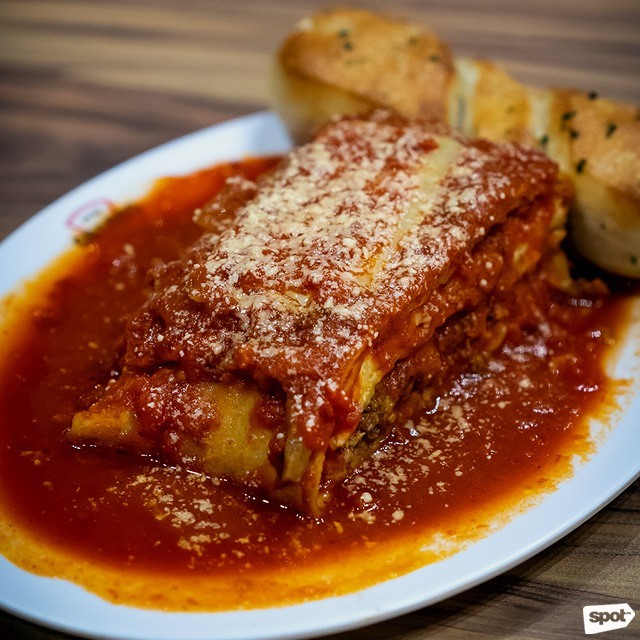 Though known for their spaghetti, TOSH offers a classic lasagna that will take you back to your childhood days and the typical savory, value-for-money fare you got at the school cafeteria. Its mild, meaty flavor will satisfy most people’s palates, and the creamy cheese atop the noodles and sauce delivers a pleasing flavor and texture that you just find addictive. See a list of The Old Spaghetti House branches. 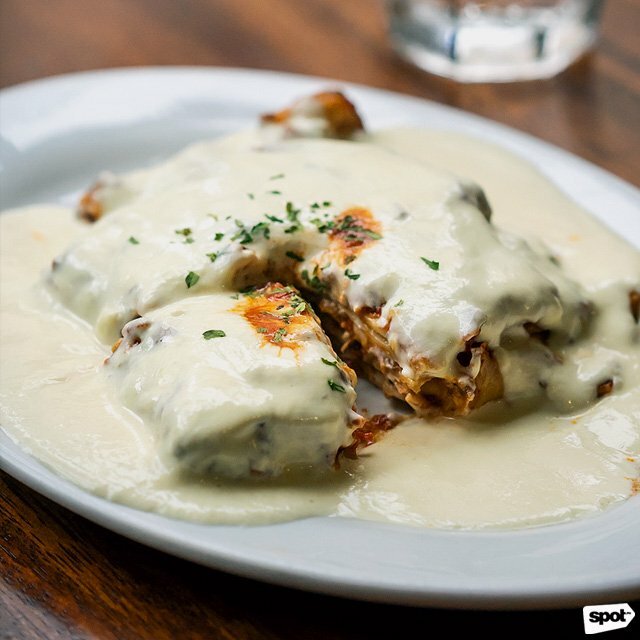 If béchamel is your jam, then Mama Lou’s Lasagna, which is literally slathered in the milky, creamy sauce (you barely see the noodles peeking out), will definitely be your go-to pick. The meat between the layers of lasagna noodles is chunky, balancing out the texture of the silky béchamel. 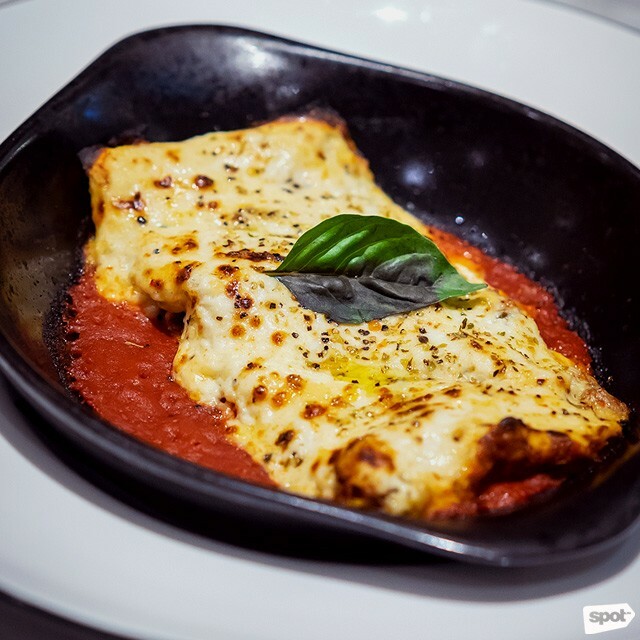 Baked in a brick oven and topped with both parmesan and mozzarella cheese, Mama Lou’s Lasagna gets extra points for the complimentary basket of soft bread with olive oil and balsamic vinegar. For more information, log on to Mama Lou’s Italian Kitchen’s Facebook page. Sbarro has been delivering huge slices of pizza, cafeteria-style pasta, and other casual Italian fare in the country for decades. Sbarro’s Meat Lasagna has, over the years, been an excellent food-court option, giving you bang for your buck. You get a choice of tomato or white sauce to top off your lasagna (we highly suggest the tomato sauce for its extra zingy flavor), along with a stick of garlic bread. 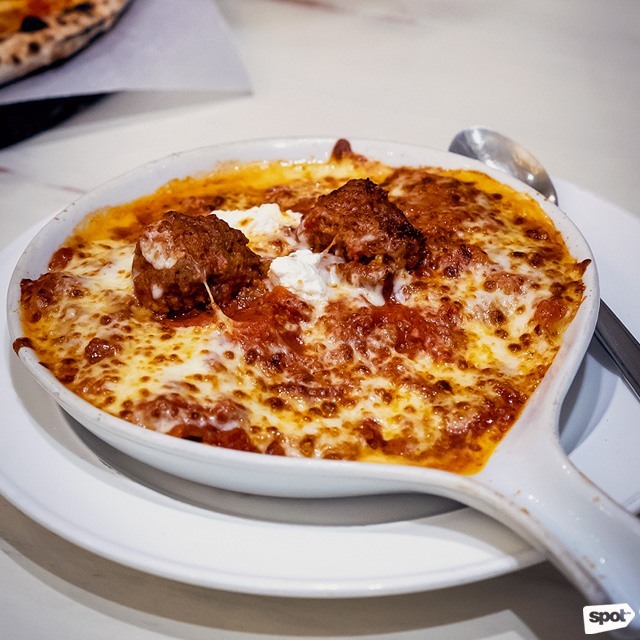 If you’re a fan of Sbarro’s meatballs, you’ll appreciate the savory meaty sauce that comes with this dish. Plus, the surprising chunks of cheese that come with each bite make this pasta pick extra special. If you’re looking for a dish to take to your next potluck party, you’ll be scoring a win by taking a tray of meat lasagna from the House of Lasagna (you’d expect no less from this restaurant’s name, after all). Mild and smooth in flavor, this crowd pleaser of a dish is packed with 100% ground beef simmered in Chef Erick Congmon’s special sauce and béchamel. Baked with cheese and served with garlic bread, this lasagna is fuss-free, uncomplicated, and the best party pick. See a list of House of Lasagna branches. 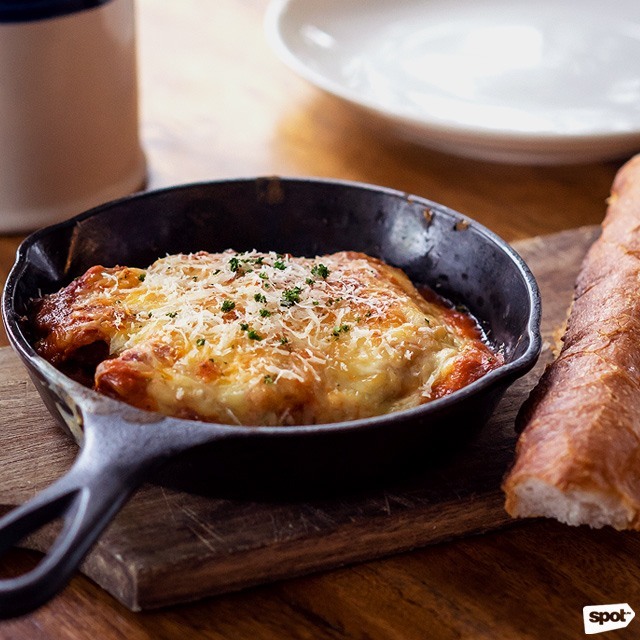 The U.K.’s popular pizza chain arrived in the Philippines in January 2018, bringing along their classic lasagna offering. If you like your lasagna noodles with some bite, Pizza Express’ version of the dish is the one for you. Chewy layers of noodles hold sharp, salty cheese and peppery beef bolognese together, creating the perfect pasta dish for someone with a craving for carbs and protein. While lasagna usually comes in hefty servings, this one is enough for a single person—no sharing required. Pizza Express is at Uptown Place Mall, Uptown Bonifacio. Served in a skillet and coupled with Wildflour’s famous house bread, this Lasagna Bolognese is a hearty treat with a smoky flavor that’s a great match for the rainy weather. The melt-in-your-mouth mozzarella of Wildflour’s lasagna is a definite winner, and its meaty layer, comprising ground beef and Italian sausage, provides a warm and savory kick. It would behoove this pasta dish to get a little more time in the oven—having a toasty, crunchy top layer of cheese would instantly make Wildflour’s version an even bigger hit than it already is. 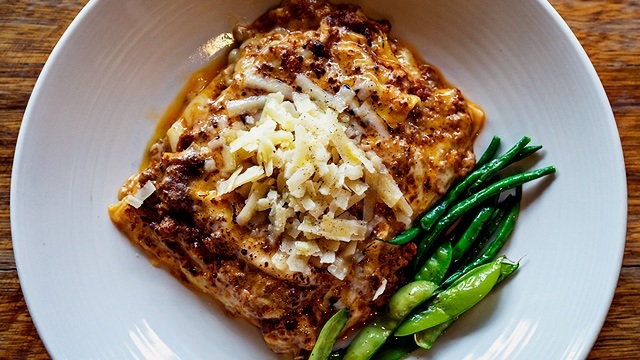 Twice the size of most lasagnas in other restaurants, Parmigiano’s Lasagna Bolognese delivers a mighty punch. Topped with meatballs and a chunk of cheese on top, this version of lasagna is certainly Garfield-worthy and is good enough for the whole table. Great for adults and kids who will love the gooey, stringy cheese that comes with every forkful, this rustic lasagna emulates the brand of warm, comforting food you would expect from an Italian home kitchen. Parmigiano has branches at Resorts World Manila, Pasay City; and Molito Commercial Complex, Alabang, Muntinlupa City. If you’re a stickler for handmade pasta, this little neighborhood restaurant along Pasay Road will give you what you’re looking for and so much more. Croque takes the usual beef and pork ragout that goes with lasagna, layers it with handmade noodles, and tops everything off with a lovely serving of provolone cheese. A smart and tasty alternative to the typical mozzarella, the provolone topping offers a milder, gentler flavor to this pasta dish, redefining what the term “melt-in-your-mouth.” Another plus? Croque’s staff provides excellent service. Croque Café + Bakery is at G/F Dominion Building, Pasay Road, Legazpi Village, Makati City. 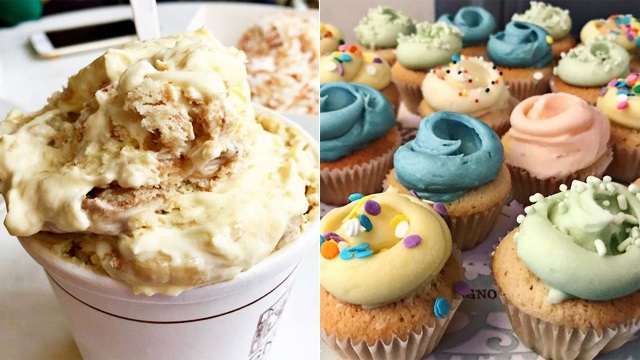 Who doesn’t love Cibo’s pasta? This homegrown Italian eatery has been providing simple and delicious comfort for decades now, giving its loyal customers the same high-quality fare over the years. Margarita Fores’ version of lasagna is fragrant and aromatic at first bite. 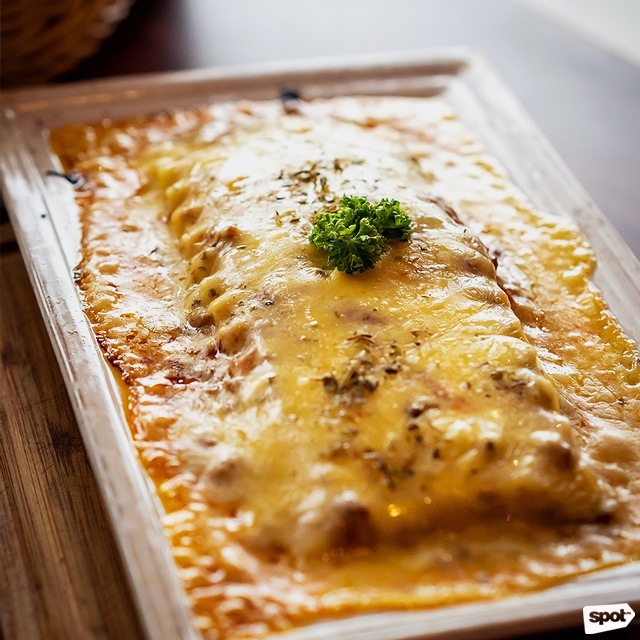 Not your typical Pinoy lasagna (which tends to favor sweet rather than savory), Cibo’s Lasagna Classico is cooked Bologna-style, with a beef and pork ragout layered with mozzarella and parmesan. The béchamel sauce is off to one side of the dish, giving you the option of dousing your forkful of lasagna in sauce or taking it béchamel-free. The best part of this lasagna is the tutong that comes on top—chewy and providing additional texture to the dish, rounding everything off beautifully. The Wholesome Table prides itself in using organic ingredients and natural sauces and condiments made from scratch. It’s no wonder, then, that their take on the dish comes off as extremely fresh. 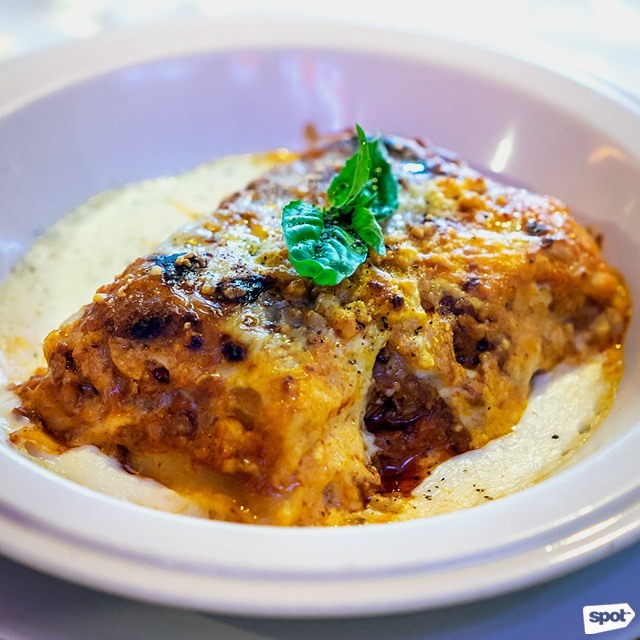 With grass-fed beef, béchamel and mozzarella all layered with lasagna noodles, this gorgeous creation possesses a delicious tang. Its béchamel sauce is just right—not over the top, not lacking—it complements the entire pasta dish flawlessly. You can tell that it spent some time baking in the oven—giving this version's mozzarella topping exactly the texture you’d look for in the perfect lasagna. See a list of The Wholesome Table branches.